The participants will be met at Reykjavik Airport (KEF)* and transferred from there to the hotel by our shuttle. Checking in to the hotel will be followed by collection of the motorbikes, signing of contracts, organising the luggage, and finally a welcome dinner offered by Ride True ADV. The departure on the motor-bikes is scheduled for the following morning. From the centre of the Icelandic capital we shall take the ring road directly to the east and, once we reach the F208, aim to use the energy of this first day of travel for this unpaved stretch of road with plenty of river crossings (at least 7). The track crosses the Friðland að Fjallabaki National Park and, after an exciting series of crossings through more or less deep water, we shall return to the ring road to spend the night at Skafarretpur. We shall continue to travel directly to the east along the ring road, crossing the Skeidararsanduril Desert before coming to the spectacle of the Vatnajokull Glacier, not only considered the largest glacier in Europe but also the fourth largest icemass in the world, after the Campo di Hielo Sur in Patagonia. From the glacier’s Jakursarlon Lagoon we shall see seals sporting themselves around the icebergs. The ring road looks out onto the ocean, with strong wind gusts near the Almannaskarð Pass, but we shall continue undeterred to the Oxi Pass, climbing the 30 km of unpaved roads in the mist and spray from the waterfalls around us. Once we reach Egilsstadir we shall descend through a long series of curving bends to the sea, beside which we shall spend the night. 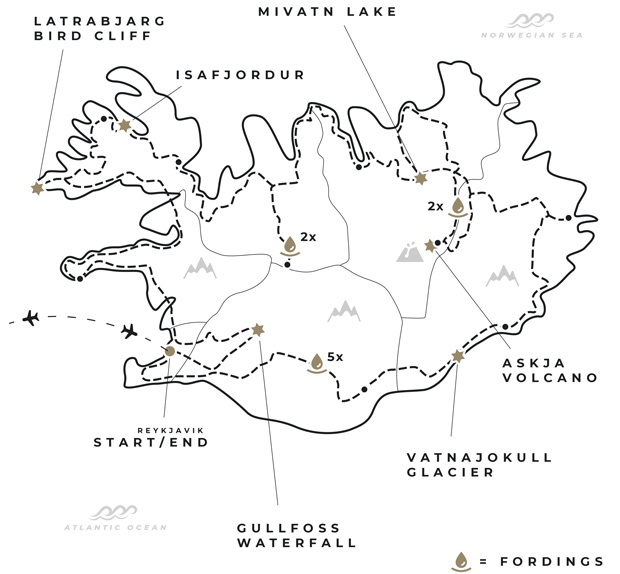 The asphalted road of the eastern fjords will take us to the plateau and the heart of the Myvatn Nature Reserve, home of at least fifteen species of duck. From the shores of the lake we can admire the breathtaking lava formations created by the contact of the burning magma with the cold water; in several areas this has formed structures that are tens of metres high, the so-called ‘black castles’. The group will finally be able to enjoy a thermal bath in the Myvatn Nature Bath. On the next day the group will discover the Dettifoss waterfall and embark upon the well-known F88, known for its demanding unpaved surface and its two deep river crossings. We shall be able to admire the Askja Volcano between the sandy and the stony lava stretches, but the effort will be amply repaid by the possibility of immersing ourselves in the warm waters of the Viti crater. We shall leave the Askja Volcano behind us and return to the ring road by way of the evocative F905, with its labyrinthine paths and the enormous lava boulders to be seen. As soon as we regain the asphalt we shall visit Modrudalur Farm, famous for its characteristic houses with their turf roofs. We shall then continue towards the west to visit the Godafoss waterfall. We shall reach our destination in the early afternoon. We shall then set off quickly to enjoy a late afternoon of relaxation or extreme adventure. Those participants more inclined towards relaxation can have free access to the thermal pools of Hverallavir, just a few metres on foot from the area in which we shall spend the night. Those seeking extreme adventure and adrenalin on the other hand can follow Gionata a few kilometres further north and tackle the F734, a road which presents two of the most difficult river crossings yet faced. We shall retrace our path along the 85 km of unpaved road northwards, only turning northwards towards the western fjords once we reach the ring road. The asphalt alternates with the excellent beaten road surfaces that penetrate this region, immersing us in the salty sea breezes. The sea will actually be the main player today, accompanying us for hours and hours as the guide of our motor-bikes. Route 61, characterised by a smooth and free-flowing road surface, will take us to explore innumerable fjords. The area is almost uninhabited and so very lovely. We have left the more inhabited areas behind us and here we can watch groups of sea lions and seals sprawled on the beach enjoying the sun in total tranquillity. This day gives us one of the longest stretches of unpaved surface of our adventure, but we are on our way to Latrabjarg, the most western extremity of the island and also the westernmost point of Europe. On its southern side it is bounded by a cliff rising to 441 metres above sea level. From this exclusive viewing point we can also watch the puffins, not at all frightened by our presence. We travel south, passing the fjords and the sea eagles’ nesting sites. Route 60 takes us to the Snæfellsnes peninsula where the Snaefellsjokull National Park guards the deep fissures in the lava stretching down to the very heart of the force of nature. It was here that Jules Verne placed the entrance of his Journey to the Centre of the Earth. Today is centred on our visit to the Gullfoss waterfall, often called the ‘queen of all Icelandic waterfalls’ for its drama, beauty and the play of light on its double leap. 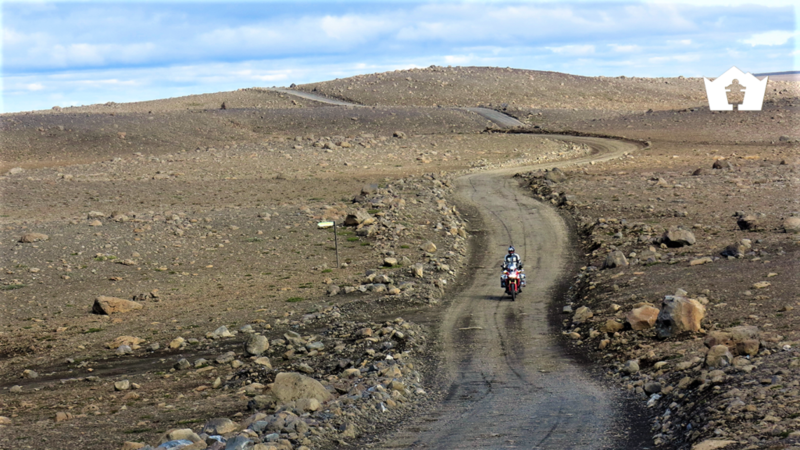 It forms part of the so-called Golden Circle, the sum of the better known and visited Icelandic attractions that we shall visit in the saddle of our motor-bikes. For our last guided day we shall visit the Reykjanesfólkvangur National Park with its famous Krisuvikurberg Cliffs and the bridge of two continents, where a little bridge joins the two extremities of a sandy gulf that separates the North-American continental plate from that of Europe. We shall arrive at our hotel in the early afternoon to put our motorbikes on board a lorry and prepare ourselves for the farewell dinner offered by Ride True ADV. Departure will be the following morning. The participants will be taken by our shuttle to Reykjavik Airport (KEF), from where they will return home by their pre-booked flights. BIKE TRANSPORT ONLY = only bike transport, no participation in guided tour. Prices are in EURO VAT included, rider based on twin room and for a minimum of 12 bikes. The first and last days mentioned in the itinerary are the arrival and departure days for tour start and end. Depending on the country you start in, you may have to leave a day early, subsequently, you will arrive one day later back home. This tour starts in Reikyavik (KEF) and ends in Reikyavik (KEF). Book your flights accordingly! Route and overnight places may change due to unforeseen events.